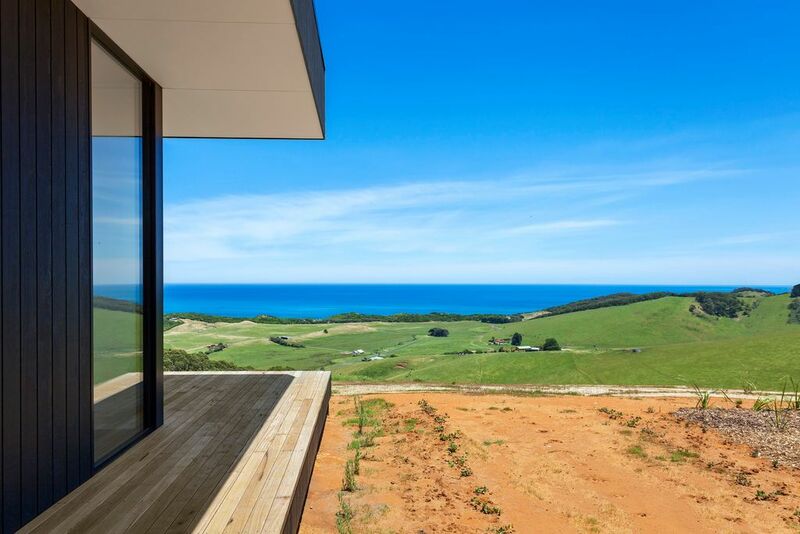 Be one of the first people to stay at this brand new house in the stunning secluded rural and seaside location of Johanna. 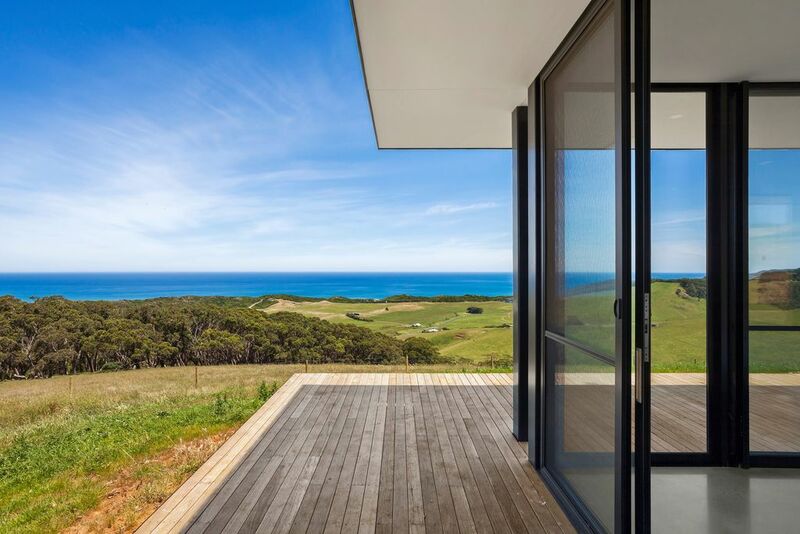 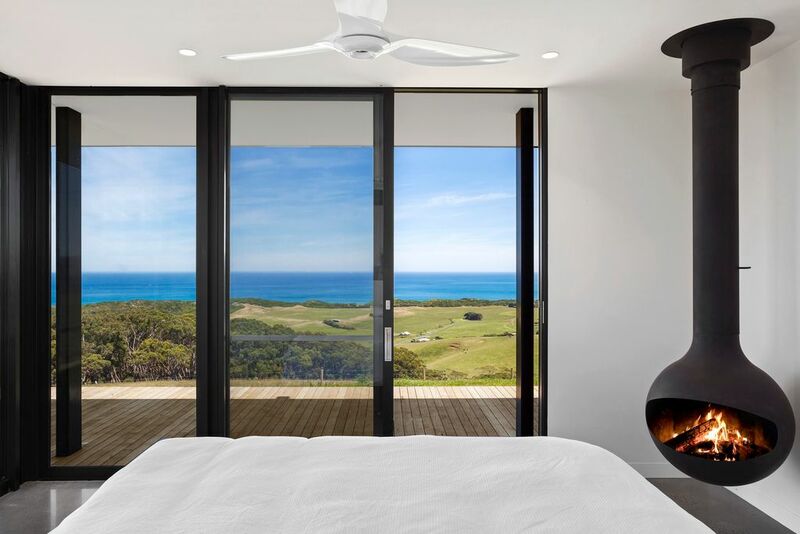 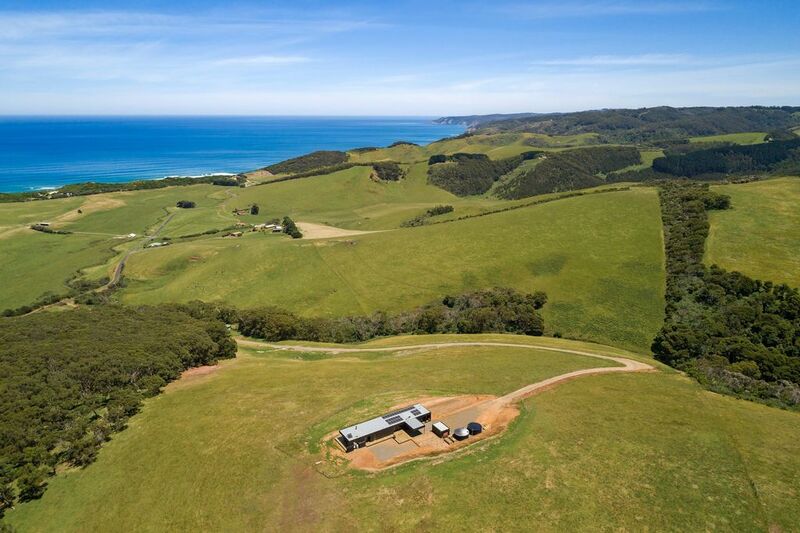 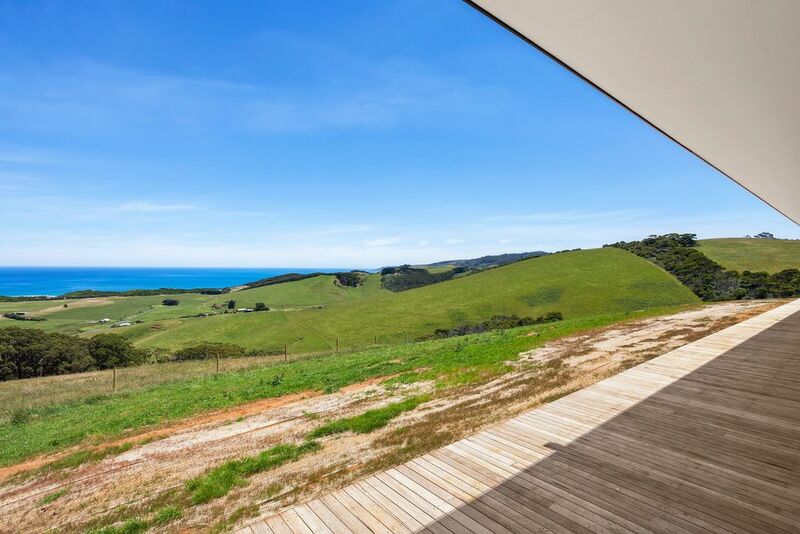 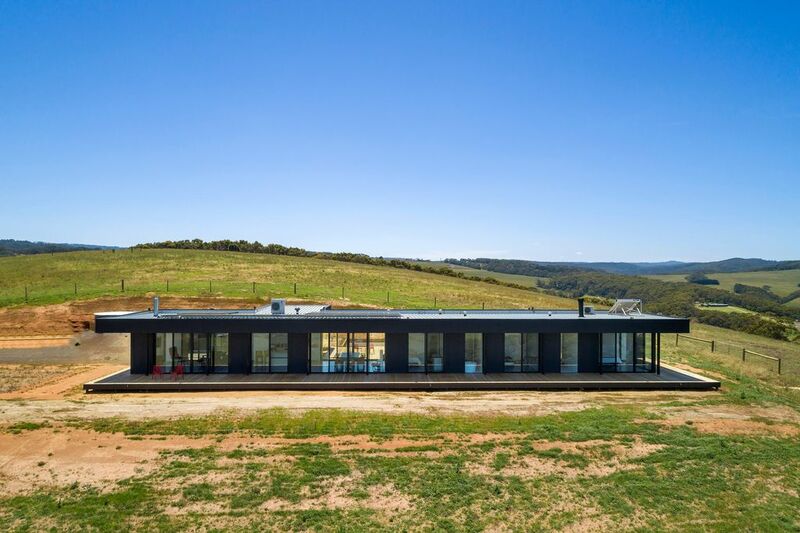 Perched high on a hill top, Southerness at Johanna has a commanding post, overlooking the Johanna valley, with emerald green hills billowing down to the famous Johanna surf beach. 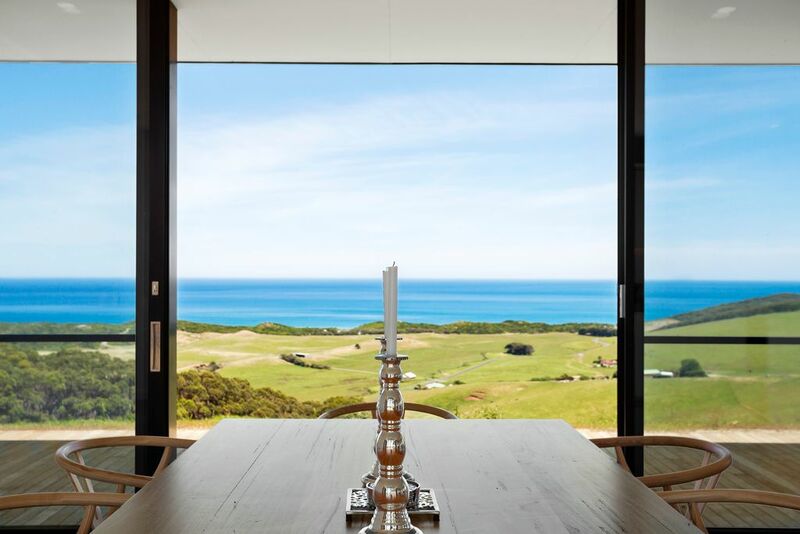 The design of the house optimises the extraordinary views from every room, with many framed scenes to discover throughout. 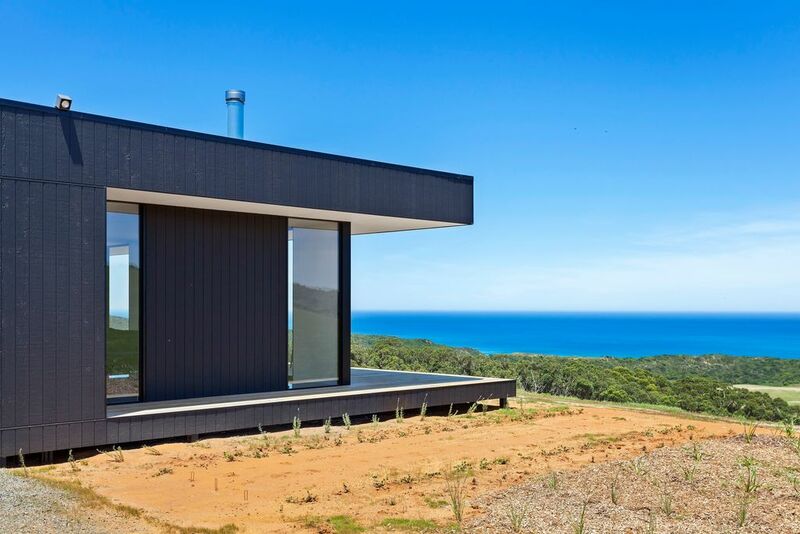 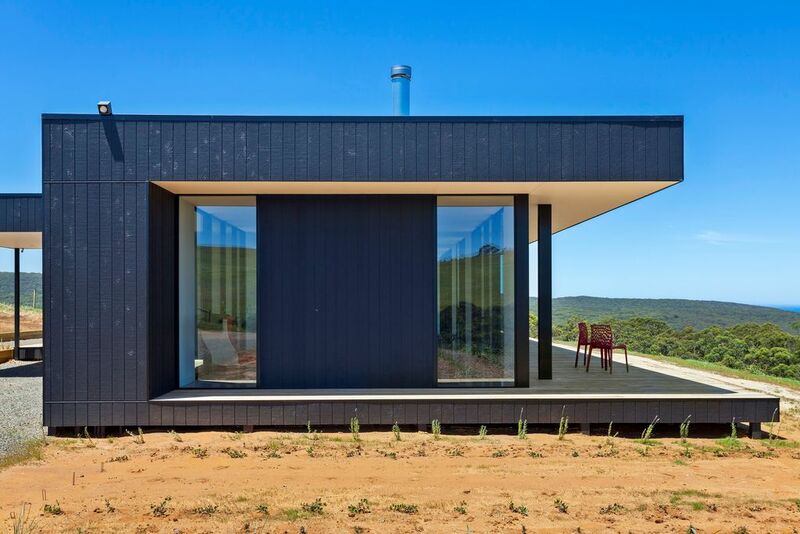 The architect for the project was Nick Carr of Intermode in Melbourne, and the house is typical of their style. 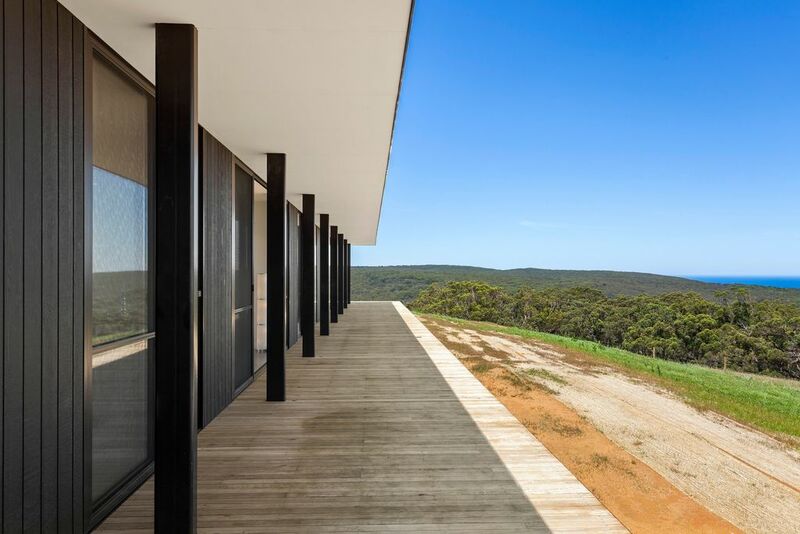 Floor to ceiling windows strategically placed South/North and East/West provide framed views right through the house to both landscapes. 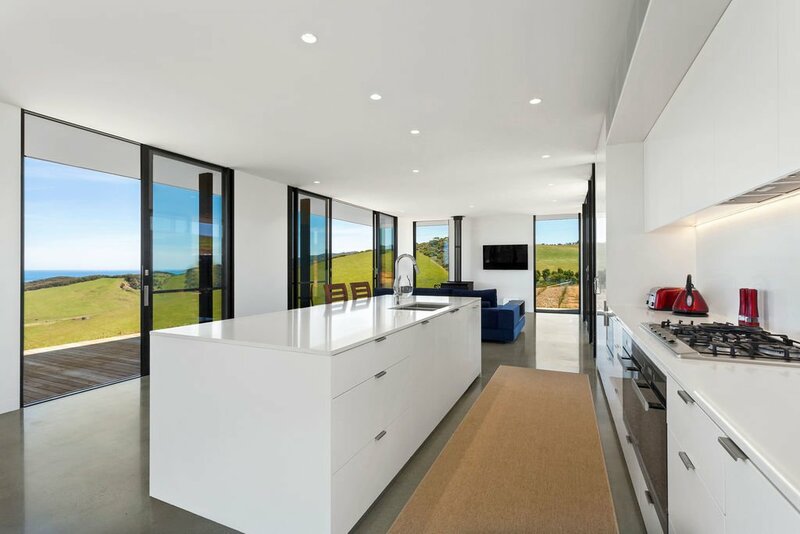 Enter into the open plan living, kitchen and dining space. 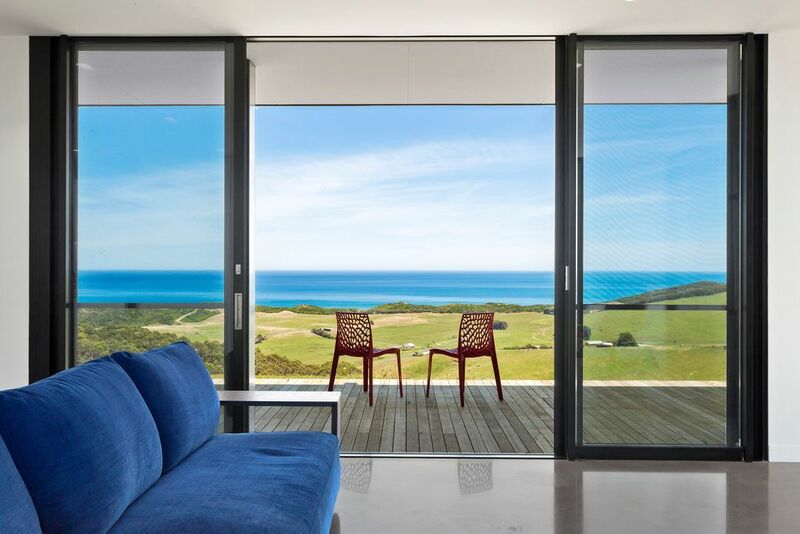 Sliding glass doors lead on to the wrap around deck which runs the entire long length of the building. 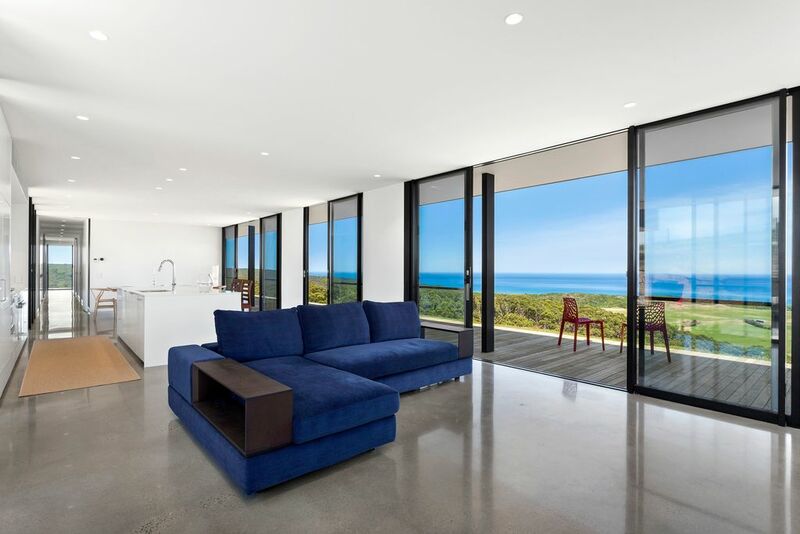 The lounge has a comfy chaise lounge facing a large wood fire, and wall mounted large TV with surround sound system. 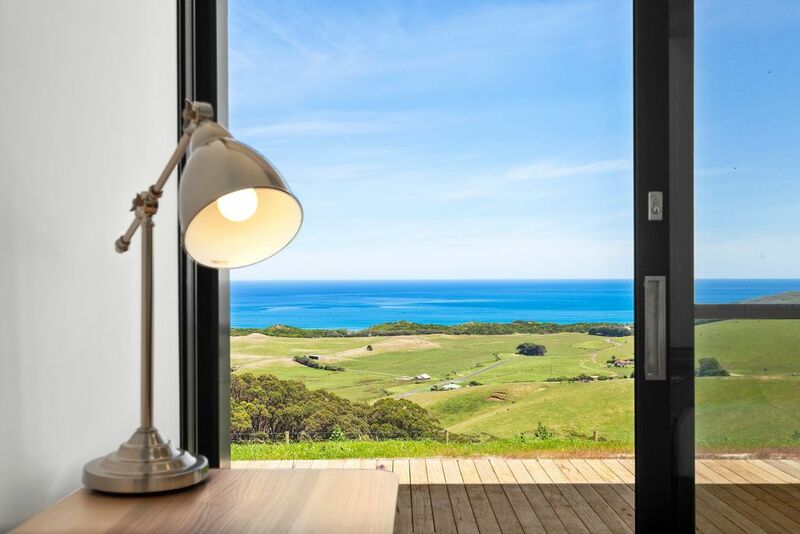 Free Wfi is also available during your stay. 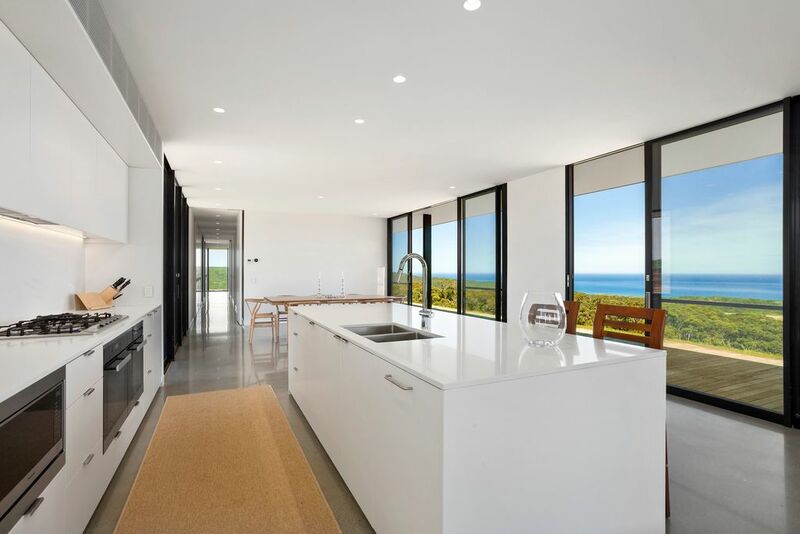 The chefs kitchen has a large island bench and is very well equipped with double ovens, gas cooktop, dishwasher, microwave, large fridge and ample cupboard space with a full range of cooking items and utensils. 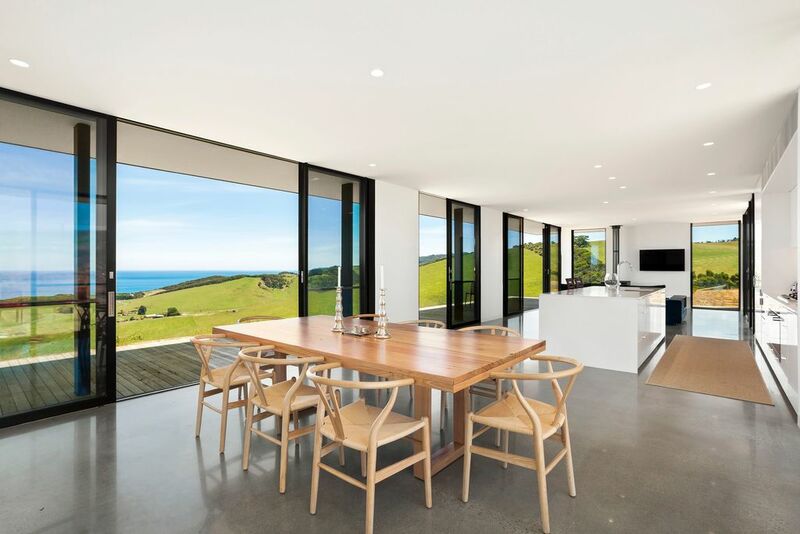 The timber dining table seats eight, and additional sliding glass doors lead from the dining to the North facing deck, containing Weber BBQ and outdoor furniture. 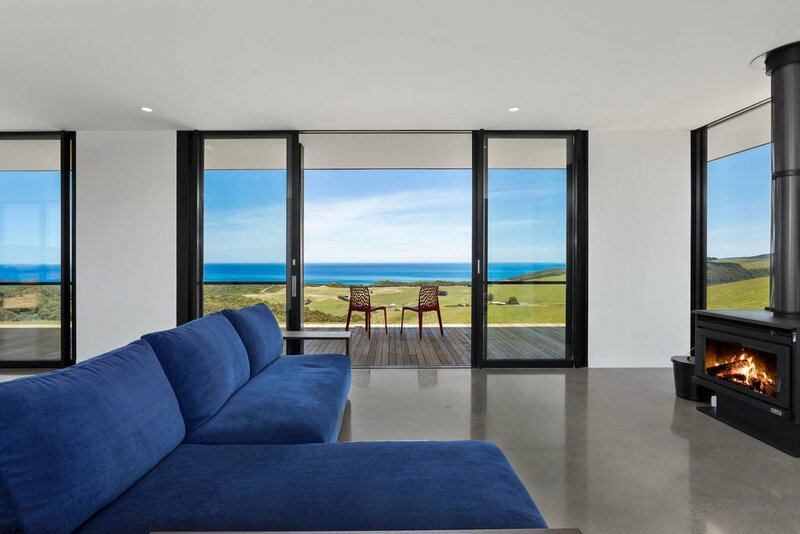 A passage runs the length of the house, and off this are the three bedrooms, two bathrooms, additional powder room and European laundry. 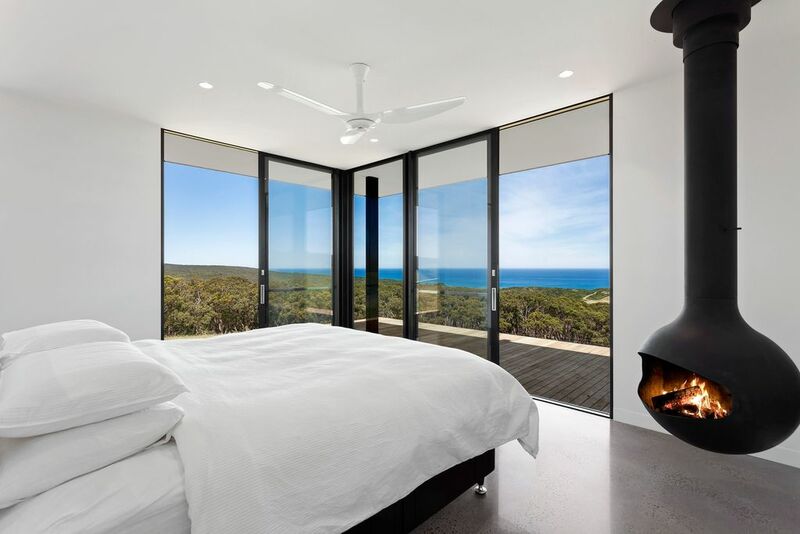 The master bedroom is at the far Eastern end of the building and features, along with breathtaking ocean and landscape views, a high quality king bed and ceiling drop open fireplace. 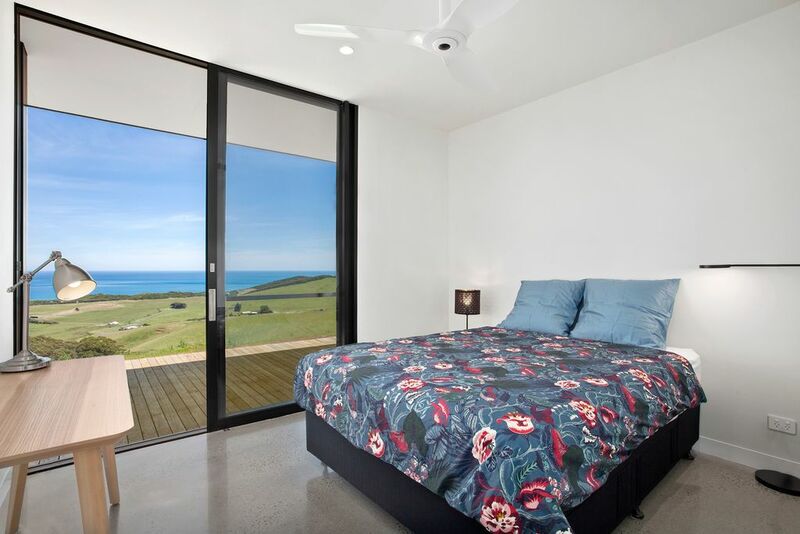 The other two bedrooms both have queen size beds. 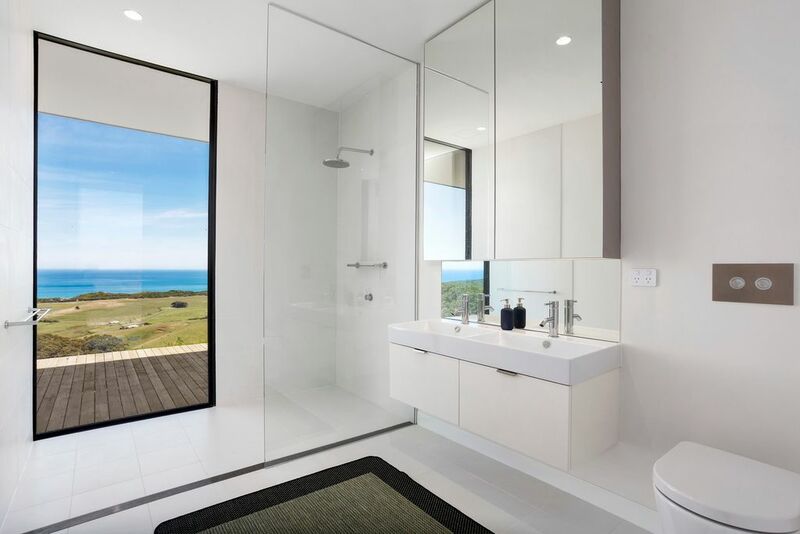 The pure white bathrooms are simply classic in their design and fittings. 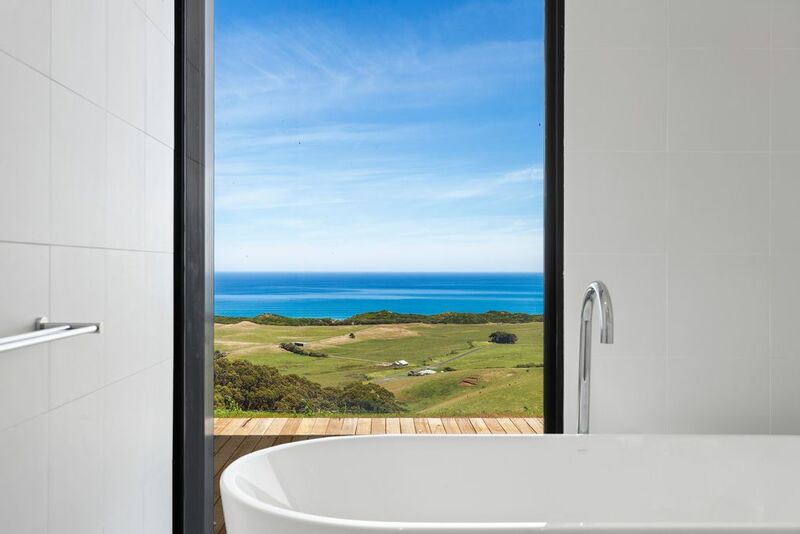 Relax in the bath enjoying the sunset views and colours over the farmland and ocean, or check what the surf is looking like in the morning from the shower! 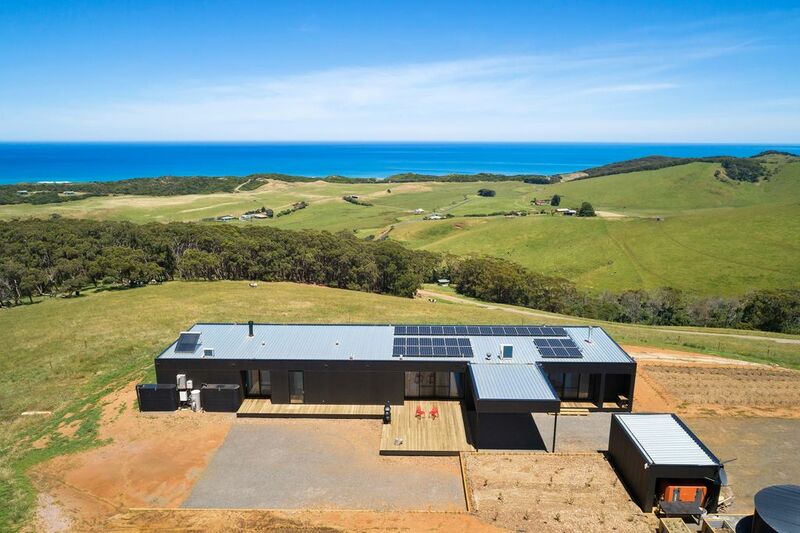 The house is completely off-grid, with a large solar system providing all the power requirements for the house, and a back up generator that automatically tops up batteries if required during the Winter months. 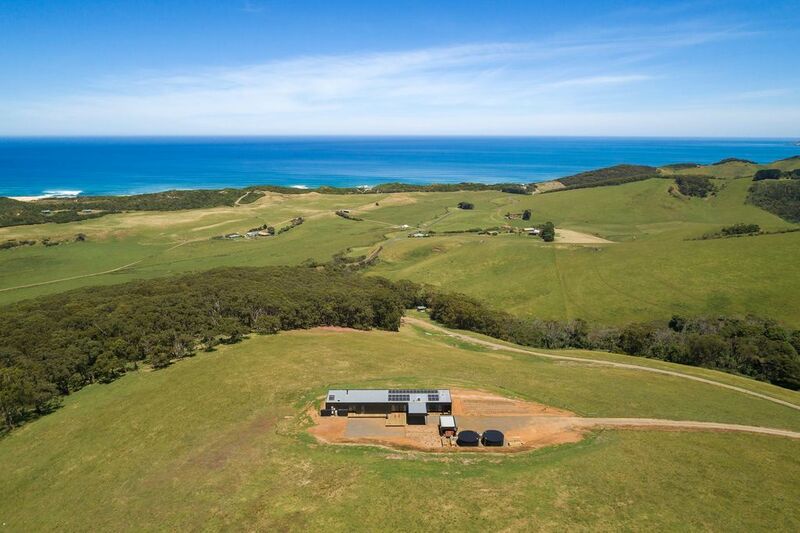 Otway rainfall is collected into large water tanks which provides all the water for the house. 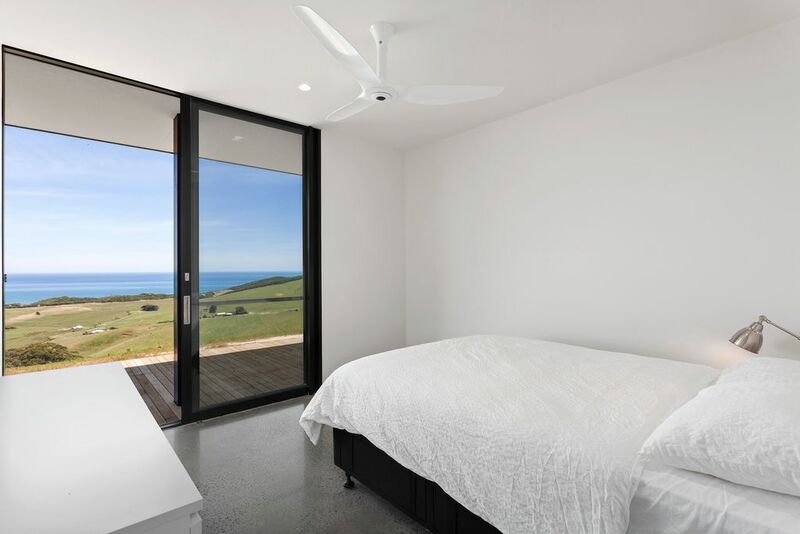 While being completely self sufficient, every comfort and modern amenity is also catered for, with underfloor heating throughout, air conditioning, double ovens, and laundry including dryer. 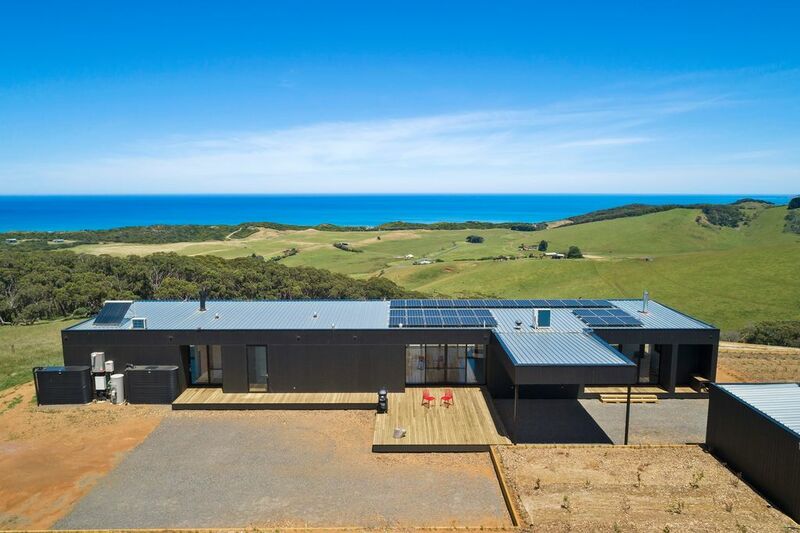 The house is on 100 acres of rural farmland and bush. 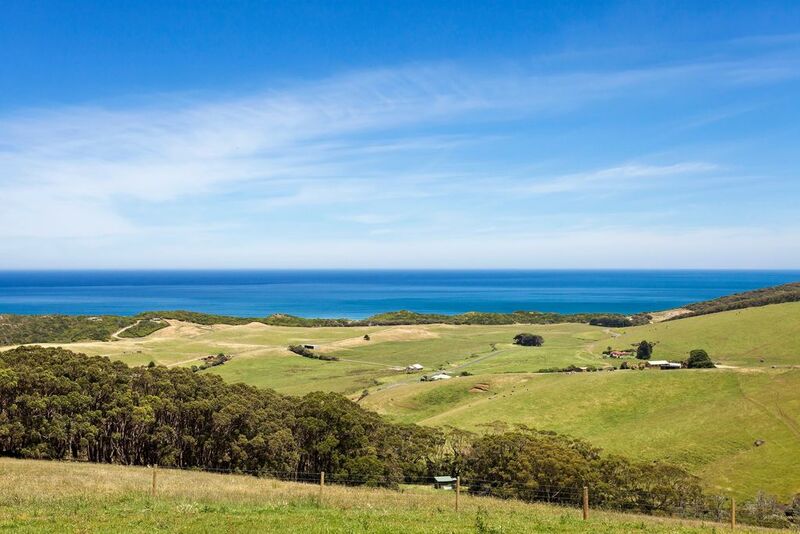 Feel free to explore the property, wander through the private bush walks and visit the inquisitive cows. 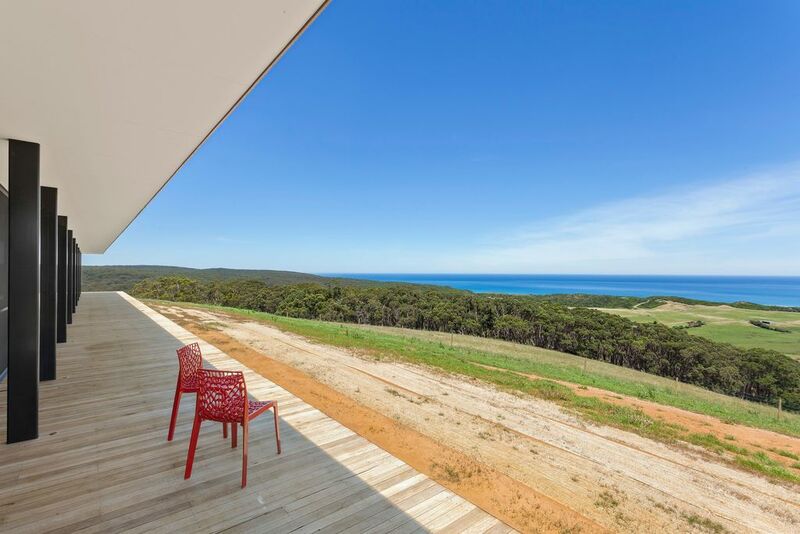 Southerness at Johanna is a pet friendly property, so you can bring the whole family down to explore the area. 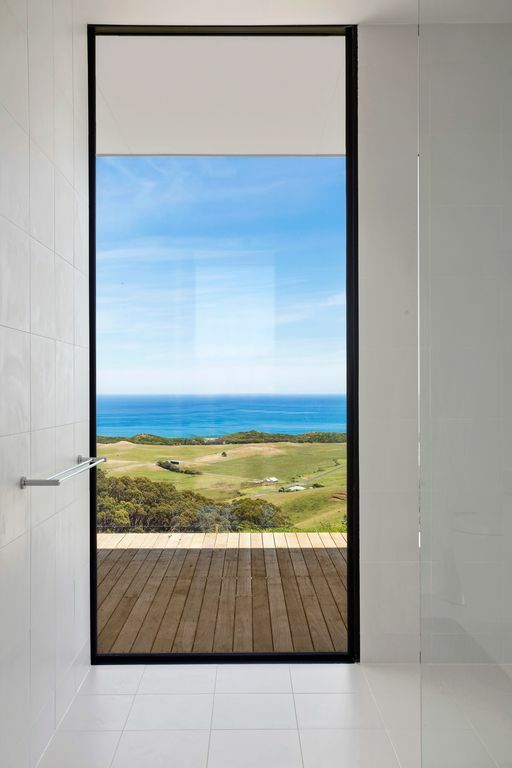 Johanna Beach is a dog friendly beach. 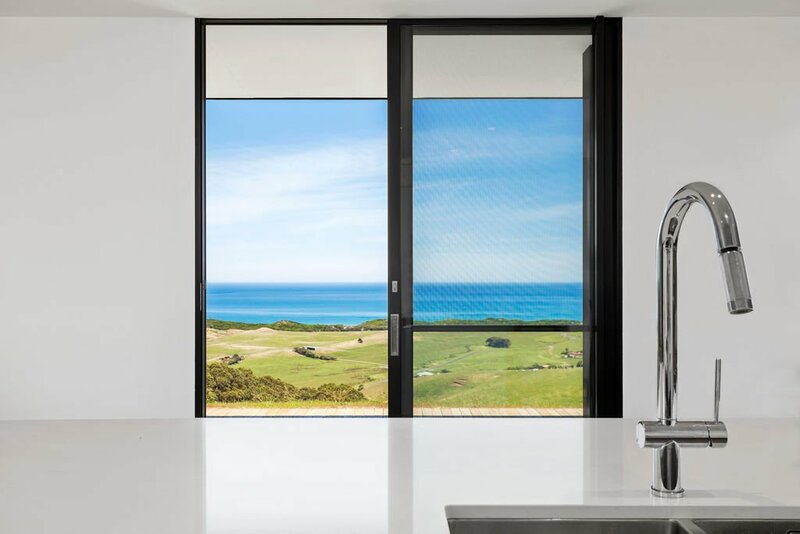 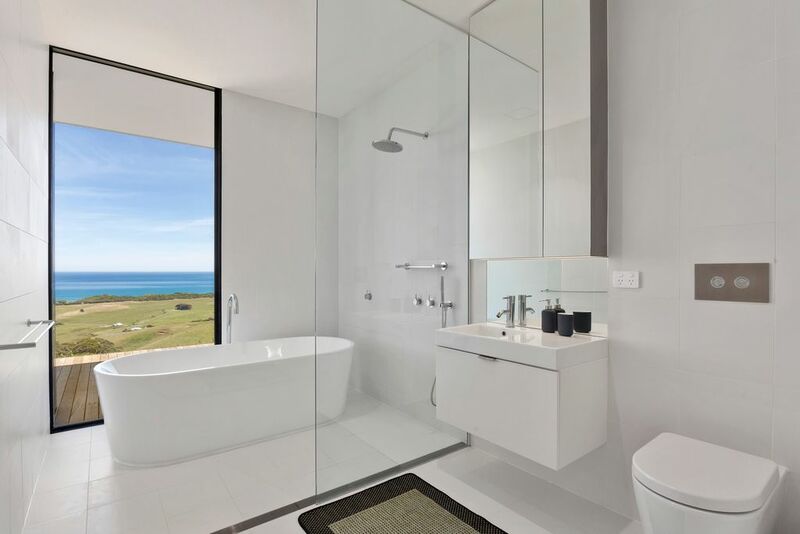 Sensational elevated ocean and farmland views Two bathrooms – both with ocean views, one with freestanding bath with view.